Reindeer Cam or ReindeerCam is a Christmas website for kids featuring a web cam of a reindeer pen so you can check in on Santa’s reindeer via your computer or ReindeerCam App (available for iTunes or Android). If you’re looking for some sort of animated Christmas magic or video cam setting with sterling production values, look elsewhere. While ReindeerCam is short on frills, there is something mildly addicting to watching the beautiful reindeer (Sissy, Ginger, Mrs Stix, and others) hang out in their enclosure and waiting for food. Santa Claus makes appearances by sitting down and reading stories on occasion. There’s a newsletter signup feature that allows you to get the times for when you should tune in. You can even get reindeer feeding times on the website or watch Santa Claus take on for his journey on Christmas Eve at 8p est. Reindeer Cam has a “Nice List” feature on their website which is a way for your child to be listed on the website by writing a letter to Santa, You can get a Santa’s Candy Cane Mailer complete with ornaments and goodies by purchasing one for $15. Sure, there’s money to be made with Reindeer Cam, but at least they’re discreet about it. 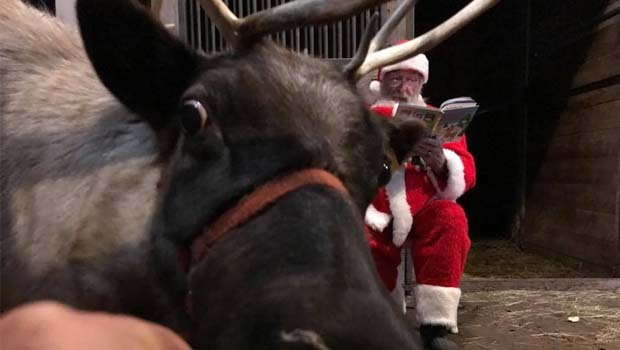 In previous versions of Reindeer Cam, there were not-so-discreet cash grabs of donating to the reindeer and getting on the nice list… for a cost LOL. They seemed to have backed off of all that a bit and it’s appreciated. Fair warning… If your child is expecting flying reindeer or something off of an animated Christmas special, this website may disappoint. If kids just wants to see these majestic animals in their natural environment, ReindeerCam is worth checking out. Pic courtesy of Reindeer Cam facebook page.